The purpose of the IWA Disinfection 2012 Specialist Conference is to provide a forum for scientists, consultant engineers, industrialists, equipment manufacturers, government regulatory agencies, and water and wastewater utility professionals from around the world. Themes will include controlling and minimizing the health impacts and risks of pathogens and byproducts generated by disinfection and inactivation processes. This conference will allow professionals to examine the importance of pathogens in water and wastewater, sludge and excreta, to determine the formation of disinfection (reaction) byproducts, to review recent advances in legislation issues and to gather new insights into processes for future needs in disinfection and inactivation issues for developed and developing countries. We are pleased to offer discounted IWA membership to conference attendees. Please click here for more details. FREE subscription for the first year! This conference is just one of between 15 and 20 events organised by the International Water Association (IWA) each year. 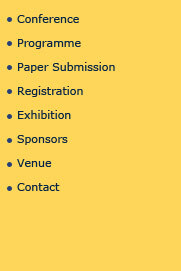 A varied conference programme is part of the range of activities IWA organises for its members. As a member of IWA you will become part of an organisation with members in more than 100 countries worldwide. In addition, you will enjoy benefits that will help you keep abreast of important technical developments and advances in water quality management. These benefits include a subscription to the magazine Water Quality International, free membership of IWA Specialist Groups, and discounts on IWA conference registration fees. Any delegate attending this IWA Conference and paying the full non-IWA member registration fee is entitled to a FREE first year IWA membership. Instituto de Ingeniería, UNAM (2011-2012). Apartado Postal 70-472, Ciudad Universitaria, 04510, México, D.F.